(Nanowerk News) Leonardo da Vinci first discovered the sliding rules of friction hundreds of years ago, and since that time our scientific understanding of the force is well known — that is until you reach the nanoscale. For example, it was only recently that scientists were able to verify the lack of friction, known as superlubricity, in graphite at the atomic scale (Physical Review Letters, "Superlubricity of Graphite"). This understanding is an important step as scientists around the world, including those at IBM, continue to investigate devices known as Microelectromechanical systems, or MEMS. MEMs are miniaturized mechanical objects like tiny gears, pumps and sensors which could be used for any number of applications, including targeted drug delivery, blood pressure sensors, and microphones for portable devices. While several aspects of superlubericity were published in 2004, a quantitative description of the different interacting forces, including both friction and adhesion, didn’t exist — until today. Thanks to the paper, "Adhesion and friction in mesoscopic graphite contacts", appearing in the peer reviewed journal of Science, IBM scientists have not only uncovered the quantitative secret to understanding friction in such materials, like graphite, they even invented a way to measure it. Authors of the Science paper: A. Knoll, E. Koren, C. Rawlings, E. Lörtscher (U. Duerig is missing). The paper details how, for the first time, IBM scientists can mechanically measure the tension and friction of two sliding sheets of graphite. Since this was previously poorly understood and just based on theory, the team also had to invent a mathematical expression to illustrate what they were seeing with their atomic force microscope (AFM), which turned out to be in excellent agreement with theoretical models. The answer the team discovered is that the friction is randomly determined in nature and directly based on the interaction between the proportionate lattices of the material, in this case graphite. As reported in the paper: The results suggest that the friction force originates from a genuine interaction between the rotationally misaligned graphite lattices at the sliding interface. This is remarkable because it is a well known empirical fact and also predicted theoretically that fractional scaling is an extremely fragile interface property which can only occur if the lattice interaction is not perturbed by defects or contaminations. 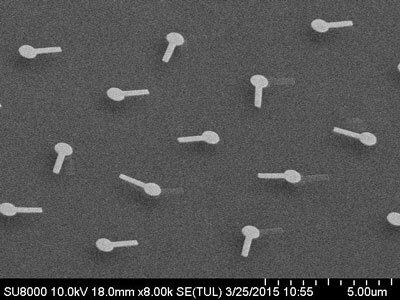 SEM image showing several bearing devices pointing to different directions. Adhesion and friction are critical to understand with MEMS. At this scale, energy dissipation and wear have a huge influence on how the devices are designed, particularly with what materials they are designed with, due to the large surface to volume ratio. IBM scientists have been motivated by this challenge particularly around the use of carbon based materials like graphite, which are very promising for MEMS applications. A general phenomenon associated with 2D layered materials like graphite is the strong suppression of sliding friction and striation forces or superlubricity. Using an AFM, the team sheared the surface of the graphite and then took measurements which revealed the mechanisms of friction and adhesion. IBM scientists are interested in using superlubricity in the possible design of a new transistor, commonly referred to as the "next switch." The lack of friction could make a transistor that generates less heat and therefore uses less energy. The team also hopes that these findings will someday help other scientists design energy efficient MEMS devices.